Peter Parker, a spider who grew up to the tales of his uncle, who’s persistence in weaving a web, motivated the Scottish King Robert the Bruce to fight his 7th battle against England, was told time and again that perseverance pays. Like his uncle, Parker was made to believe that the only way to success is to try, try and try. But tired of firefighting all his life and smart as he was, Parker invented ‘web-shooters’, a device worn on the wrist that can shoot thin strands of web at long distance. While earlier he weaved web to merely build himself a home, now he can spin web in multiple forms – a shield, parachute, safety net etc – that can save an entire city of spiders! With businesses, big and small, blooming all over the world, the growing demand for commercial spaces never ending, the art of having a well-maintained building has never been more important. For decades, Facilities Management has been the backstage hero, shoving off limelight, yet toiling hard to keep buildings in good shape, making more off less. Today, as the quality of built environment increasingly impacts workplace productivity and property value, commercial real estates crave to have an edge in the way buildings are managed. How to cut through the real estate noise, amidst perfect competition? While commercial spaces rely on the quality of building and its management to attract premium tenants and millennial occupants, a slow yet steady shift in FMs earlier being looked at as mere cost centres to revenue/profit centres now is already on the rise. The global FM Industry is visibly enthusiastic and open to investing time and money in innovations, adopting latest technologies like IoT, AI, SaaS and mobile in buildings. 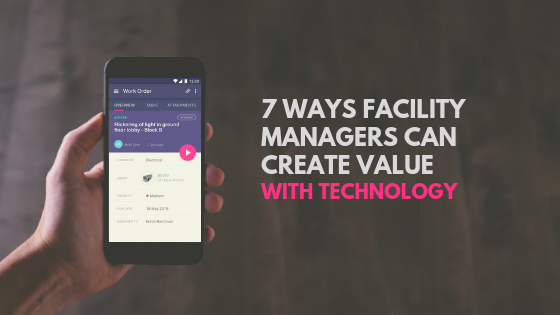 It is clear that technology can ramp up the shift to value-driven Facilities Management by enabling faster response, smarter solutions, better visibility and hence a lot more credibility. The time is ripe for FMs to wield technology and transcend as value players in the ecosystem. How to make ends meet? The best facilities are ones that retain the rhythm in operational routines, react quickly to any glitches and restore order before they scale into chaos. By setting up smart workflows that constantly track asset performance, predict, alert and prevent anomalies, manage facilities proactively reducing overall operational cost and doubling down asset downtime. With historical and real-time data from buildings, drive informed purchase decisions to evaluate, improve and justify asset investments. How much efficiency is too much efficiency after all? With end-to-end digitization of FM, channelise workforce productivity to full potential eliminating inefficient paperwork and manual systems. Make actionable sense out of real-time data to optimize asset, workforce and sustainability performance everyday, reducing wastage and saving money. ML-driven performance analytics and custom KPIs help exactly pinpoint abnormal patterns and suggest corrective measures. Forever stuck in the wheel of budget, FMs are often deprived of innovation and hence efficiency. Buildings with investment-heavy infrastructure can leverage existing automation systems to churn contextual insights from unexplored data, making more off what is already available. With IoT technology, make legacy systems smarter without uprooting existing expensive infrastructure. Shuffling between distributed sites to keep tag of assets, equipments, buildings and work status across portfolio is easier said than done. Remotely manage all of your portfolio needs with a centralised system that has asset, energy and operations data across portfolio in a single platform for analysis. With a central source of action now, gain bird-eye view of entire portfolio, driving portfolio-wide efficiency centrally. The efficacy of FM team lies with how well it can communicate and coordinate to move maintenance work in break-light speed. By fully automating work orders, operations and maintenance, stay on the same page with your entire team. Assign, track, pick up and close work orders on the go by moving all work to mobile, dumping excel and manual systems for good. A centralised helpdesk system to collate all service tickets and a central dashboard to view and track progress with team-based widgets can ease the entire lifecycle of tenant complaints. Now handle problems, from the word go! When problems in your buildings are real-time how can the solution be static? Rely on a strong Fault Detection and Diagnostic (FDD) system that integrates with real-time data to stay on top of problems, any breakdown immediately alerted with fully mobile notifications, ping-me dashboards and real-time alarms. With automated data->insights->anomalies->alarms->action workflows, be readily available to attend problems quicker than ever. At the end of the day what matters the most is occupants’ experience whilst their stay at your premises. By improving the nuances of work and efficiency with technology, work harder towards elevating the aesthetics of your service, approaching FM as a holistic means to make tenants happier. Steer the wheel of fortune in real estate by improving the value of property while enhancing occupant experience, keeping both sides of the coin in harmony. The global FM market – combined market of FM tech and services – is making genuine attempts to transcend from mere cost centres firefighting all day to value-players impacting built environment at large. The revolution has already begun and.. Lives in the world of stories. Millennial vacations to reality.